Over the years I have admired Mid Century Modern style. And who doesn’t right? Well, The sleek lines, the mix of natural materials and textures, organic influences, beautiful silhouettes – it all feels timeless to me. I’m also intrigued with how the functionality follows the form without losing its understated style. It’s similar to the characteristics of Scandinavian design with slight differences in use of natural lighting and color palette. 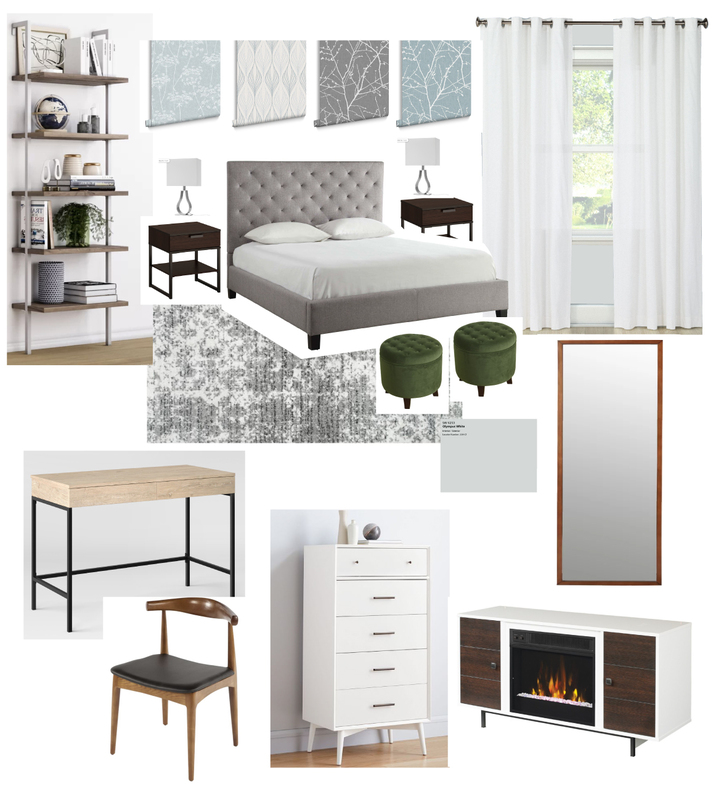 To stay with a serene and airy look and feel, I wanted to mix Mid Century Modern style with the Scandinavian design into our Master bedroom. Styling and decorating are important as much as the functionality of the furniture within the living space. After all, you want to be able to feel comfortable walking around in the space you live in. The furnitures that are in the room should serve its purpose, not just as a decoration. To achieve that idea, I have a general guideline of choosing furniture/items for the room that I have been using. I normally use this process after I have an idea of a design style, look, and feel that I want to create. This is where I started to identify the problems of what needs to be addressed in the room then I listed them out. Simple enough. 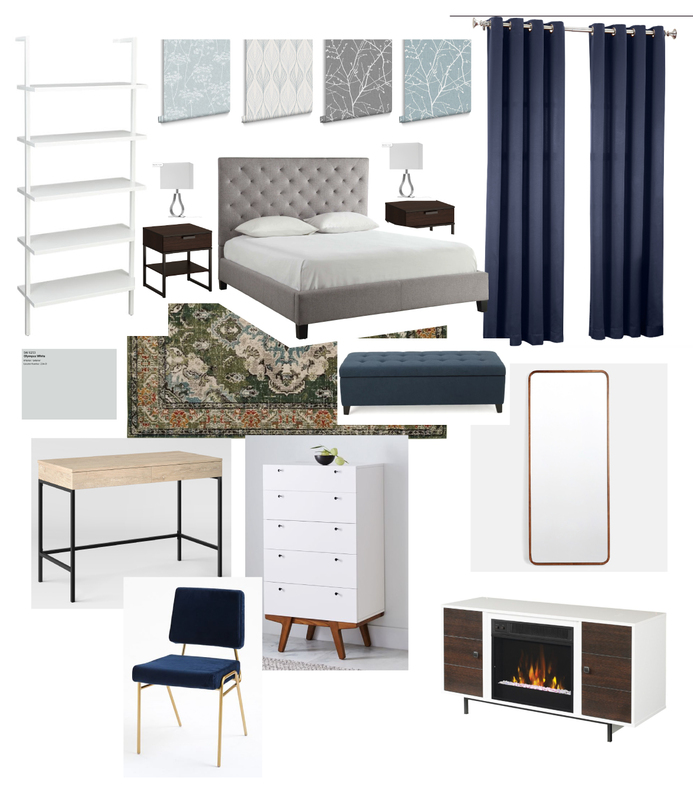 I know the word “problem” is not a positive feeling to start something fun but in this case, it helped me start and narrow down which furnitures I need for the room, especially the big items. The list could be anything from “the room is too bright” to “not enough storage”. Then I find a solution and carefully select each furniture to fit the need and problem while still keeping the design aesthetic in mind. Also worth noting when shopping, especially for furniture – always check the measurements first (W x H x D). While the design of the piece is important, the measurement is also crucial. Make sure that it will fit in properly within the area. Problem No. 1: The master bedroom has a high ceiling, which I really love. But the openness can feel empty and cold sometimes. Solution: To help eliminate the feeling of emptiness, I plan on adding a statement wall. It will help add a focal point to the room and personality to the space. Problem No. 2: The master bedroom is located above the garage. In winter, this is the only room in the house that is a lot colder than the rest of the house. Additionally, there are four big windows that the cold air can come through. Solution: Adding an electric fireplace is the easiest way to fix the problem and also add an appearance and character to the room. Besides, I don’t want to deal with the installation (cost + time) of a built-in fireplace. We are going to add a large area rug. Hopefully, that will help block some of the cold from the garage ceiling. Adding curtains to help decrease some of the cold air that comes through the windows should also remedy the problem. Problem No. 3: We don’t have a lot of stuff but extra storage is always a must. The only storage space we have in the bedroom is a walk-in closet, which is a good size. But for two adults, we definitely need more. Solution: We are going to add a drawer and other items that can be used as storage. Storage doesn’t always mean a box with a lid. Muti-purpose pieces of furniture that are both stylish and functional as storage is the answer to this problem. For example, an electric fireplace that we need from problem number three would help if we could find one that has storage space or additional platforms for say a nightstand or other items. Problem No. 4: No light in the room. Adding a desk lamp or floor lamp will not be enough light. I love that soft glow light from lamps that makes an entire room feel relaxing and soothing providing enough light to see the space. It’s nice to have that as an option but we still need a light that will fill up the room brighter entirely when needed. Problem No. 5: We need more airflow. Problem No. 6: I’m not sure if I wanted to categorize number six as a problem. It feels more like an opinion. If you are living alone, the interior style can be personalized to your taste. But as a couple, I would want my husband to feel comfortable and love the design as well. Even though he agrees with every design I show him…lol. Our master bedroom, for example; I asked him for his opinion on how he would utilize things around the room so that I can design accordingly. He likes to read before bedtime, so he would have stacks of book on his side of the bed floor, even though we have bookcases in our office. It’s messy for him to put the book away down on the floor all the time. He also draws occasionally and works on his laptop in the bedroom so it would be nice to have a desk up here. Solution: We will add a book shelf on his bed side and a desk that can work for me as a make up table and for him to work and draw at night. These are my main problems / fun problems to solve:) Not only will this list help me get started, it will also help me know exactly what I need for the room. This list is a very personal preference because both of us interacts to the bedroom space differently at times. So already, the space needs a personalized design that caters to both of us. Later on, the room will be accessorized a bit and there are going to be small minor tweaks that I could not think of at the time… which is ok. At least we got all the issues to fix out of the way. Next, creating a mood board from the problem/solution list. Creating a mood board helps visualize an overall design concept keeping me on track and saving me time. Sometimes, it happens where I do not create a mood board and it’s okay. But in those situations, I know what the problem is and I know exactly what I need. Our small and narrow hallway is an example of that, which at the time, I simply made a quick sketch on a post-it note and ran with it. I know it’s a shortcut but the space is very small and I know what I was doing … it also worked:) Now let’s talk about these two mood boards. I made two mood boards that is similar but distinctive enough as its own concept. Mood Board No.1: Cozy & Calm – To create a calm and cozy effect, I used dark blue as the main color (curtains, storage bench, desk chair). While dark wood added warmth to the space. Then I balanced the rest of the room with white and lighter toned items because it could feel like a cave if there is too much dark tones in the room. Mood Board No.2: Fresh & Laid-Back – To create a warmth and relaxed look and feel, I used wood and different textures on most of my main items (bookshelves, fireplace, chair, mirror, side tables). It warms up the space nicely. The rest of the items in the room are in white or lighter color, it helps soften the wood tone and feels fresh and clean. At this point, I favor mood board number two because we mostly have similar blue tones in the living room and I wanted the bedroom to feel a little different from the first floor. I am excited for the next step because that’s when all of my concept designs come in life!